A guide for traveling to some of the top destinations in Colombia's Caribbean region. 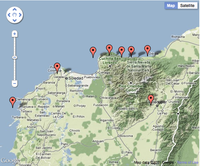 Cartagena, Barranquilla, Santa Marta, Tayrona National Park, Costeno Beach, Palomino, and Valledupar. Restaurants and Popular Activities.